MADAM CHANCELLOR, as a fatherless child growing up in Tehran, Djavad Mowafaghian took his mother’s lessons about kindness and generosity deeply to heart. Her influence during his early years manifested in remarkable acts of philanthropy that have improved access to healthcare and education for children in many parts of the world. During the 1970s, an ambitious entrepreneurial spirit propelled him to develop one of Iran’s largest general contracting companies. He subsequently moved to Switzerland, but remained connected to his homeland by funding the construction of 26 elementary, middle and technical schools, some of which were specifically designed for visual- and hearing-impaired students, and one for physically disabled girls. In 1987, Mr. Mowafaghian immigrated to Vancouver, where he established a commercial real estate development company and continued to support a wide range of education and healthcare initiatives in Europe. In 2003 he established the Djavad Mowafaghian Foundation, which has provided generous and critically important support to numerous healthcare organizations in Vancouver, including BC Children’s Hospital, enabling the creation of a much needed oncology unit. 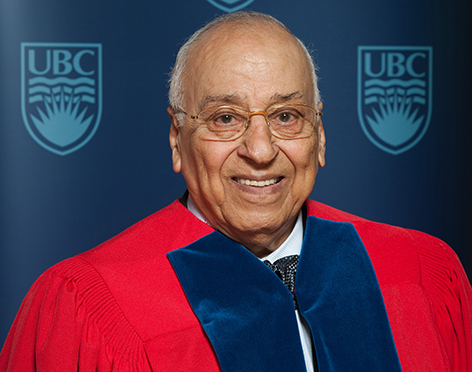 He has also made significant contributions to other local hospitals and universities, including UBC, where he has enabled new forms of interdisciplinary research of brain disorders in children through the creation of a new Centre for Brain Health that bears his name. In addition to supporting a growing list of local charities, Mr. Mowafaghian has maintained his international focus, including recent support to help build a school in Haiti, to establish scholarships for international students in England and to fund bone marrow transplant facilities for children in Switzerland. Not surprisingly, his extraordinary philanthropic record has been recognized with numerous honours, including the Order of British Columbia, and his recent appointment as a Member of the Order of Canada. Madam Chancellor, in recognition of decades of vision, kindness and generosity on three continents, I ask you to confer the degree Doctor of Laws, honoris causa, upon DJAVAD MOWAFAGHIAN.